In 1919, the Tennessee General Assembly passed the Tennessee Memorial Act, which established plans to build a memorial for veterans of the First World War that could also be used for state office space and public gatherings. Also in the plan were gardens and an extension of Deaderick Street; previously, the street ended at its intersection with Fifth, but the new development stretched it to Capitol Boulevard, practically to the steps of the new War Memorial. 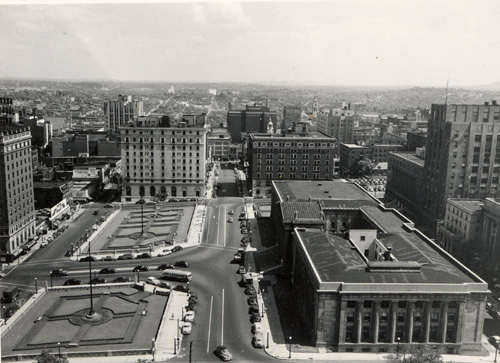 The Andrew Jackson was built on the newly created corner of Sixth and Deaderick while construction on the memorial and square was still ongoing, and while an overlook of the new development was particularly attractive to potential guests to the city. The closeness to the capitol, the new offices in the War Memorial, and business district was a selling point as well. 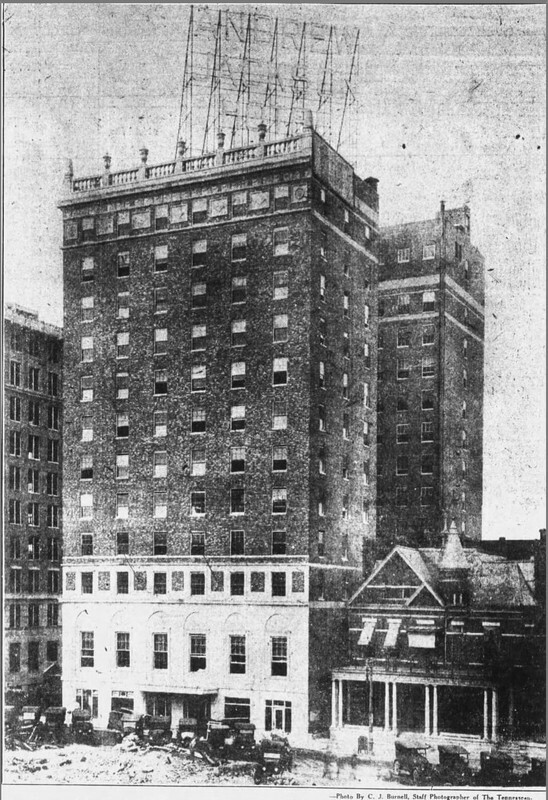 On August 29, 1925, the hotel opened with a reception, drawing attention to its luxury and modern conveniences. The hotel proved popular and opened to the public two weeks later. In a later interview with the Tennessean, Leon Womble, manager of the hotel from 1939-1969, listed some of the famous guests of the hotel. Alben Barkley, vice president under Truman, stayed on part of his honeymoon with his wife. King Peter of Yugoslavia stayed in an early point of World War Two, so he could see Yugoslav pilot training at the Sewart Air Force Base in Smyrna. Mae West stayed during an ill-timed freeze in 1951, and despite a shutdown of most of the hotel's services, they still found a way to bring her room service. Lyndon B Johnson and John F. Kennedy stayed while they were senators. Other purported guests included Walt Disney, Rudy Vallee, Susan Hayward, Andy Devine, Bill Thompson, Robert Preston, and infamous gangster John Dillinger, who supposedly carried a tommy gun in a suitcase for his entire stay. The hotel had brushes with local Nashville elite as well; singer Roger Miller was known as the "singing bellhop" before he got his big break, and Tennessee Senator Albert Gore met his wife for the first time in the hotel's coffee shop, where she was a waitress. It was not to last, however, and shut down in June of 1970, after a plan by ownership to renovate the hotel fell through. The Nashville Housing Authority purchased it that July, with the intention to use the land for a then unknown urban renewal project. On June 13, 1971, crowds lined up on the square (or by television sets) to watch the implosion of the hotel, which went down in 9 seconds. 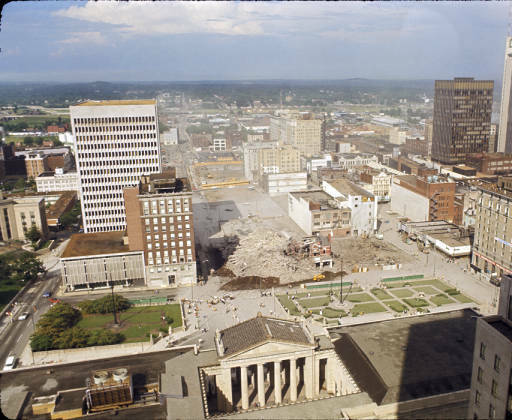 Construction began on Legislative Plaza, the raised area around the War Memorial that is in place today, in 1971 as well. Memorial Plaza as it existed in the time of the Andrew Jackson Hotel ceased to exist, linking the two structures in both their rise and fall. Further purchase and destruction of properties on Deaderick Street followed, making way for the new project. Eventually the project materialized as the James K. Polk building, which would be completed in 1981. It is now a center of business and entertainment in Nashville, and is home to several state offices, the Tennessee State Museum, and the Tennessee Performing Arts Center. Victoria Hawkins, “The Andrew Jackson Hotel,” Bygone Nashville, accessed April 25, 2019, https://bygone-nashville.mtsu.edu/items/show/23.